WHY ARE SOME SCIENTISTS CONCERNED? Interlocutor: Now I want to ask you about the well-known project HAARP a program designed to modify and control the atmospheric weather. This project is carried out by the American Defense, in short by the US American Air force. 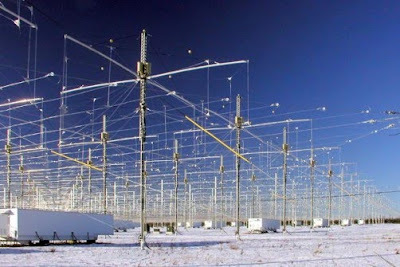 The term HAARP stands for (High Frequency Active Auroral Research Program) and these facilities are located near Gakona Alaska. It is scientific research managed by the US Air Force and the US Navy. These are some of the details I have. Is it one of the most important projects? Is it worth it to talk about this project in a next session? I ask it because apparently some scientists are afraid of this project. Ruanel: It is true; they are doing research on the topic of weather. Interlocutor: Is this project something harmful? Ruanel: No, because now they won't achieve it. Interlocutor: But why some scientists are concerned? Ruanel: They are concerned because they think that it can end up causing big vacuum explosions due to the quantum physics not well manipulated. Interlocutor: In that case, would it be a dangerous project? Ruanel: In this case, yes. Interlocutor: Is it worth it to talk about the topic in a session? Ruanel: Yes, it is important. I comment you that in Japan they have achieved for fourth consecutive time teleportation. Ruanel: Yes, very small. But this already means that they can. Interlocutor: Will we build in the future machines designed to travel to another parallel or even alternate universes? Ruanel: I interpret that using quantum physics it’s possible to go to a parallel universe, but never to alternate universes, because alternate universes are optional universes. Interlocutor: But have they done it? Ruanel: I consider that yes, since here people from a parallel universe have come which means that it is possible. Interlocutor: is it a certainty or a speculation? I ask it because perhaps some time traveler has told you something about it. Ruanel: It is a quite logical speculation which is closer to certainty, as a matter of reasoning. Interlocutor: I have another question at this time: Do people have the ability to see with their eyes closed? Ruanel: No, they don’t see. It’s possible that a person can perceive at a conceptual level what his or her thetan is “whispering”, to say it in an understandable way, but they do not see. If somebody says that he or she is capable to see through his or her eyelids, it is an illusion of the 10%. Interlocutor: I have another doubt: Can spirits know with certainty many things? For example the ID number of a person. Ruanel: We can know it entering into the person's mental decoder and if that person keeps it in his or her memory, we can know it, but we are not allowed to do it because we would be invading their privacy. Interlocutor: So if you wanted to know you could know that? Ruanel: of course, it is very simple, but for ethics we cannot do it since we would be violating their Free Will. Ruanel: You already know that we, as spirits, we contact ourselves and through a kind of pseudopods we transmit spiritual concepts, but if the other spirit doesn't want to communicate with anybody and in that moment that spirit wants to have a moment of relax to rest, it lowers its curtains- so to speak- and nobody can contact that spirit. This entry was posted at Tuesday, February 23, 2010 and is filed under Morganel, Secrets . You can follow any responses to this entry through the .